5. Dissemination of the results of the use of the model mentioned at item 1 during the participation phase envisaged for the approval of the Plan. These instruments will provide the opportunity to identify and choose the most efficient actions among those proposed in the Provincial Plan for the Protection of Waterways, taking into account the specific features of the territory, thus enabling the implementation of the Provincial Plan for the Protection of Waterways, essential for the correct planning of water resources. Subjects involved: It has been created a collaboration with the Joint research centre of ISPRA (VA), to have a scientific and methodological support for the implementation of the mathematical model and for the use of update statistic data on the condition of waters; collaboration with ARPA which is the Environmental regional agency of Emilia Romagna and with Consorzio di Bonifica. Creation of a web portal (water-net community) useful to satisfy the needs of information on procedures of several Public bodies such as Region Puglia, Province of Brindisi, Acquedotto Pugliese, Consorzio di Bonifica Arneo, Genio Civile of Brindisi, Guardia di Finanza, Autorità Bacino, and useful to find the better operative formalities (avoiding superimposition, dispersion and duplication of information). The computerized system will be instrumental to maintain a steady net of relationship and useful as a daily means of qualified information. Constitution of a technical board” aimed to find new methodologies and instruments for a better organisation of the informative stream in the field of management of water resources, starting from the present condition of Puglia. It should suggest solutions according to a more efficient sequence of actions. Other partners involved: Region Puglia, Acquedotto Pugliese, Consorzio Bonifica Arneo, Genio Civile of Brindisi, Guardia di Finanza, Autorità Bacino. - Drawing up information materials. - Improvement and integration of the information tools used by public administrations and citizens to evaluate interventions for the protection of the territory. – Experimental/test plant for biological purification of waste water. – Improvement of policy coordination skills at the County level and between all the Croatian project partners. - Information on the municipal site, advertisements, ad hoc meetings, publication and dissemination of results. – In the results two enterprises use the incubator of the chamber system. 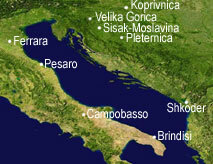 Other partners involved: Province of Campobasso, with a role in the monitoring and evaluation of the quality of intervention to provide indication for the improvement of the experimental phases, and the Chamber of Commerce of Campobasso with the role to favour new innovative SMEs in the field of water , new instruments and services to improve competitiveness. – Elaboration of project documentation for planning and management of the sewage system. - Raising life quality of all citizens in the region. – Implementation of planning activities and realisation of a experimental plant for the canalization and treatment of water discharged. – Improvement of environmental condition in the lake of Shkoder and of the surrounding territory. Other partners involved are the Local development agency Teuleda and the Regional agency for environment. - Technical documentation like plans, calculations, book, maps, diagrams, both in paper and electronic form. - Maximizing the protection of groundwater body "Kosnica I." – Waste water plan for the Pleternica rural area. - Waste water solution for 600 households. - Increased awareness of sanitary and health hazards due to bad functioning of WWDF. - Web page of Watercycle net. - To create the conditions for a cross border cooperation in a mid-long term focused on the common thematic strategies of orientation of policies in the Adriatic sea and in the EU.